The owner of Olde Fish House Marina says Waste Pro hasn't picked up her recyclables in weeks even though she has paid her bill. 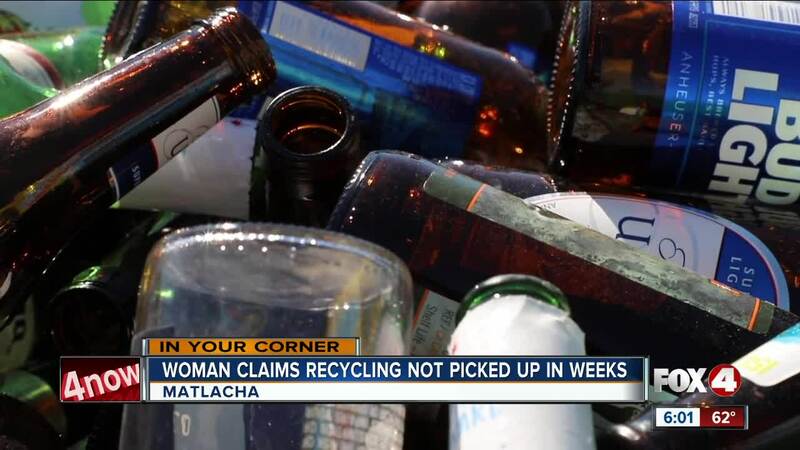 MATLACHA, Fla. -- One restaurant owner in Matlacha is fed up with her full recycle bins. Lisa Dence, ownere of Olde Fish House Marina claims Waste Pro has not picked up her recycle bins filled with empty bottles since mid-December. “They are charging me $108 dollars a month and they are not coming, they’ve picked up once,“ said Dence. Lisa says she called Waste Pro multiple times trying to get to the bottom of this. “And they did let us know they hired a new driver and he just couldn’t get to it, but that’s not my problem, your problem is to manage your employees,” said Dence. “And now I’m not eco-friendly so ya know, because I have no where else to put it,” said Dence. Fox 4 has chronicled pubic outcry when it comes to issues surround Waste Pro's service. Over the summer last year we told you how the city of Cape Coral gave the company 60 days to fix a similar problem . "We understand when they say oh we're having some problems with labor.That's not our problem and that's not our residents problem," said Connie Barron, Public Information Officer for the city of Cape Coral. Fox 4 reached out to Waste Pro multiple times Tuesday to find out if Lisa's claims are valid, but the company has not returned our calls. “I’m paying my bill, they need to provide a service that I have a contract with them for,” said Dence.